I very rarely raise my hand, preferring to keep to myself. But I like school. There's only one right answer and I take comfort in that. I wish my life were that easy. "I could eat babies for breakfast. Or stab old ladies on the train for all you know." I'm annoyed now. Yes, he's saying nice things about me but I don't like the fact that he's so smug about it. Paige gives me a brilliant smile and part of me starts that whole fantasy all over again where she's my friend. Sometimes I think my imagination is my worst enemy. 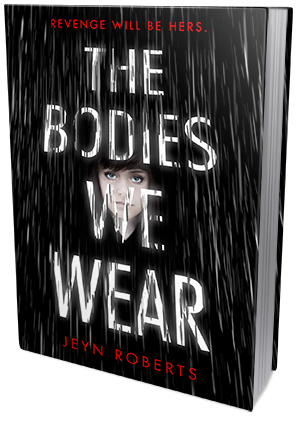 "The bodies we wear," he says. "They're not the ones we always want. They get damaged. Used. It's who we are on the inside that counts. The person waiting to jump free." This is not my first Jeyn Robert book. In fact it was her previous two books that had me so excited to read this one, even though they are completely unrelated. There is something about her writing that just draws me in and I can't help but become addicted. Maybe it is the fact that there is something dark and gritty about the books she writes. I appreciate a book that can take the sugar coating away, and push the fact that not everything is beautiful. I think the biggest thing was that the book was mainly about Faye's revenge but it was also about redemption and change that gave it, its biggest boost. We find revenge in a lot of books, but not to this extent. The main characters life was destroyed when she was little by drug dealers, making her an outcast to society, and even her own family turn from her. These little bits, mixed with the drug that was forced upon her is what makes this book so unique. The drug seems to be something that people both love and fear, and minus the death and addiction stage it was almost accepted. Basically the setting and slight changes to our current time were executed extremely well and I had no problem visualizing everything. It isn't a huge stretch to believe something like this could happen, people develop new drugs all of the time. In this I found that this dystopia/sci-fi had a realistic touch that you could see people easily slipping into. I can't say that I ever fully connected with Faye. It isn't so much that I didn't like her or did like her, as it was there was many times that I just did not get her. She did have a purpose and I understood to a point her need to get even with those that hurt her. I appreciated that she was dedicated to this cause most of the time because it gave her drive, but it also was making her miss what she had. In this sense I understood her completely, and I think this is what made her so real. Her need for revenge blinded her to everything else. However, as things normally go, it is in the darkest moments where we see some sort of light. With never having a normal life or normal chances because of her past, it just takes Faye a little longer to find her light. Chael is a mystery that I figured out decently quickly. How he came to be was my biggest question but ultimately it didn't matter. His purpose was to be there for Faye, even when Faye didn't get why he always seemed to be there for her. The attraction between them was slow building, but when it happened it was because hi secret came to the surface. I'm not sure how people will feel about it, but I loved it beyond words. They didn't just figure it out and become perfect and Faye forgot her mission, but they fought over what she wanted and stayed flawed. The romance is also not a main focus in the book but merely a spark in the dark to help Faye find her way, and to show her that there is options. Overall, I have to say I may not have gushed over this read like I did Roberts previous series but that does not mean I did not enjoy it. This read wont be for everyone because of its dealings with addiction and other things, but it should also be noted that it is used to make a point within the book. I would recommend this to those that have previously enjoyed one of Jeyn Roberts books, or those that are looking for something that holds a little bit of a darker tone.